The tremulousness of the lens with the movement of the eye is called phacodonesis. It was first described by D'Ombrain in 1936. Bellow in the year 1940 termed it cataracta tremulans. The zonules of Zinn or the zonular fibers are the supporting structures which maintain the lens in its position. They originate from the ciliary body and insert into the lens capsule at and near the equatorial zone. They are approximately 140 in number and composed of structural proteins, with one major component being fibrillin – a connective tissue glycoprotein that provides strength and elasticity to the fibers. The weakness of these zonular supports lead to phacodonesis. Zonular dialysis can be caused by a variety of conditions including trauma, pseudoexfoliation syndrome, iatrogenic, retinitis pigmentosa, advanced age, and systemic syndromes with defective connective tissue protein synthesis (Marfan syndrome, homocystinuria, Weil-Marchesani syndrome, and Ehlers–Danlos syndrome). Diagnosis can be made on the basis of history and dilated slit-lamp examination. A 56-year-old female presented with the complaint of diminution of vision in the right eye for the past 4 months following blunt ocular trauma by a bamboo stick. Her visual acuity at presentation was counting fingers at 2 meters. 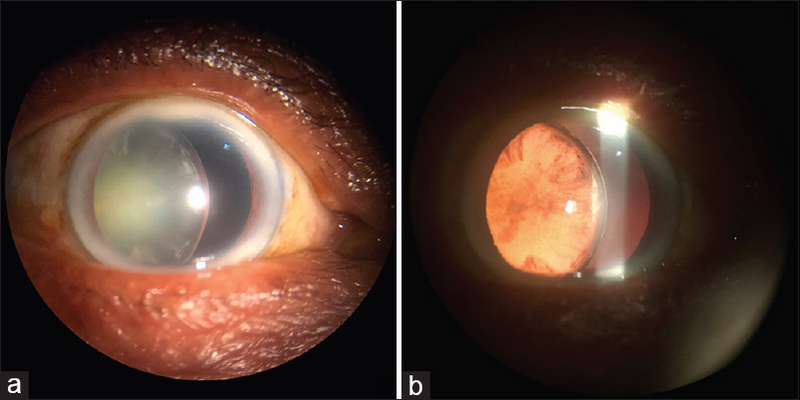 Slit-lamp examination revealed a temporally subluxated early cataractous lens with zonular dialysis from 12 to 6 o'clock position [Figure 1]a and [Figure 1]b. The phacodonesis could be appreciated very clearly and was video documented [Video clip 1]. The patient underwent successful par plana vitrectomy, lensectomy, and scleral-fixated intraocular lens implantation with full visual recovery. Thus, we present this unique photo and video-documented case of posttraumatic phacodonesis. Bartholomew RS. Phacodonesis. A sign of incipient lens displacement. Br J Ophthalmol 1970;54:663-6. Kuszak JR, Clark JI, Cooper KE, Rae JL. Biology of the lens: Lens transparency as a function of embryology, anatomy and physiology. In: Albert DM, Jakobiec FA, editors. Principles and Practice of Ophthalmology. 2nd ed. Philadelphia: Saunders; 2000. p. 1355-408. Liu XW, Wang Z, Yu WH, Wang ZW, Zhang YN, Liu JJ, et al. Idiopathic phacodonesis in senile cataract patients in Qinghai, China. Int J Ophthalmol 2011;4:508-12.